There are two opinions of the artist,John Singer Sargent One derides him as overrated – simply a portrait painter of the rich and famous. The other has re-examined his art in recent years and suggests that he is under-rated, and his skill and talent is visible in all of his paintings. People who hold this opinion don’t think that he should just be regarded as a portrait artist, although they think that he was one of the great portraitists of all time. The young painter was born in Florence to American expatriate parents who came from French and Puritan backgrounds. He had a European education and didn’t visit America until he was twenty. Although Sargent was good at languages and music, art was his true passion and his parents, who noticed his remarkable talent, wisely encouraged him. He studied in Florence but as the Academia delle Belle Arti was reorganizing he traveled to Paris where he was admitted to the prestigious Ecole des Beaux Arts. Here he studied for three years and won second prize for his work – he had had to compete with three hundred students. His next teacher was Carolus-Duran who was mainly famous for being a portrait painter. Sargent began exhibiting at the Paris Salon with portraits, amongst others, of the fashionable and wealthy Frances Watts and his teacher. His portrait shows Carolus-Duran’s good looks and love of ‘dressing up’. He received an Honorable Mention from the Salon, but American visitors described the portrait of Carolus-Duran as ‘foppish’ and ‘vulgar’, although he received six portrait commissions from the French. By this time Sargent was becoming wealthy himself and had a grand studio and servants. Although he liked the money to be gained by painting portraits, he was also described by his close friend, Violet Paget, as having an ‘instinct for the esoteric’. He began to paint more exotic subjects, such as North Africa, Italy and Spain and showed influences of Velasquez and Goya in his paintings. Sargent was fascinated by the local gypsies and flamenco dancers in Spain and his El Jaleo: Danse des Gitanes shows a passionate dancer. The opera Carmen was popular at this time so the painting was well-received by many. 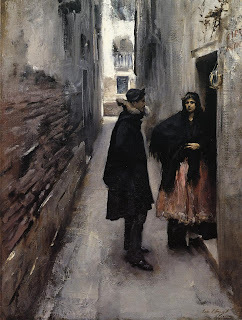 His interesting paintings of Venice which show the location as a city of shadows in an almost sinister way and his paintings of Capri also won high praise from such luminaries as Henry James. His portraits continued to be exhibited, including paintings of the elite family, the Paillerons, his dramatic portrait of Dr.Pozzi which shows Van Dyck influences, and the sweet and innocent The Lady with the Rose. Scandal came with his portrait of the ‘professional beauty’, the American Madame Gatreau, however. Her black dress with one strap off the shoulder and her pale skin, use of makeup and overt sensuality caused a sensation. Sargent’s commissions dwindled even though he re-painted the portrait with the straps on the shoulder and he fled to London. The artist eventually grew tired of painting portraits although he was the most admired portrait painter of his age. He turned to watercolors and landscapes, creating more paintings of his beloved Italy, which he said is: “...all that one can dream for beauty and charm.” He also painted nudes, mostly male, which have given rise to theories about his sexuality. Sargent created murals for public buildings in Boston and Harvard as well as painting. Sargent’s paintings have seen a revival recently with major exhibitions, but opinion will probably always be divided about this artist who painted the wealthy and the glamorous without apologizing for it.